Analog humidistat allows you to control the humidity level you desire. The optional Humidistat works with either the Hydrofogger or the Minifogger. This humidistat works well in non-critical applications such as greenhouses where there is some tolerance for humidity fluctuation. The humidistat incorporates a sensor that turns the unit off when it reaches the desired humidity level. Ideal for applications requiring under 80% humidity, however we recommend using with a hygrometer to accurately measure humidity levels. No wiring necessary-simply plug your Hydrofogger or Minifogger into the Humidistat's Piggyback Plug and that's all there is to it! Humidistat is accurate +/- 15%. Mounting screws included to wall mount the Humidistat. Shipping & Handling is free when ordered with a Hydrofogger or a Minifogger. Available in both 115 Volt/60 Hz (USA) and 230 Volt/50 Hz (International) versions. Please note that the humidistat's accuracy of +/- 15% may not be exact enough control for applications such as tobacco-which often requires finer humidity control. 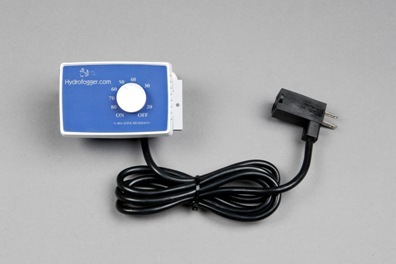 Additionally, the Hydrofogger Humidistat is intended for use only on Hydrofogger humidifiers. Any other use of the humidistat is strictly prohibited. Use of the humidistat on any non-approved application may cause poor product performance and can result in personal injury, property damage, or death.